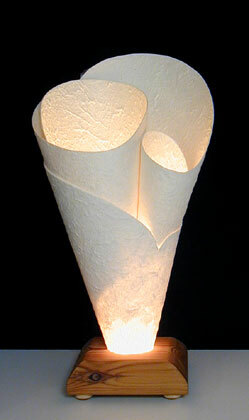 This unique showpiece table lamp displays a graceful triple conical shape with a beautiful interplay of light. The off-white paper has a wonderful fiberous texture. The solid-wood base is sanded smooth and oiled to bring out the grain. Inquire about different types of wood and finishes available (oak, mahagony, cedar, etc.) 9" x 9" x 16"